Interesting, but he ruined a nice Bridgestone! Once that flywheel is spinning, it’s going to be hard to turn the bike thru corners. The solution to this is to have the flywheel mounted like a gyroscope within 2 further degrees of freedom – thus making it very complex to add or claw back power. This is the reason inertia braking has never caught on (in anything but trams running along straight tracks). Great point Jake but I wonder though if that gyroscopic effect of the flywheel could be seen as a feature instead of a bug say in the case of riders that don’t have the best balance. But then if it makes it difficult to turn effectively, that could trump any positive balance gain. Also Aaron, why would a chain tensioner be necessary there? Because of the vertical dropouts? The most obvious problem with this “invention” (very similar things have been done many times before) is that it presumes that one can get something for nothing. Any flywheel produces energy relative to its mass and its momentum. Both of those factors depend upon a bicycle’s biggest enemy: weight. In other words, the only way that a flywheel could produce any useful power for pushing a 25 pound bike and its 175 pound rider forward is if it has enough weight to overcome inertia and keep working under load. If the flywheel weighed say, 100 pounds, it could probably do some good in propelling the bike and rider when needed. But that would come at a serious cost of having to haul along an additional 100 pounds when pedaling the rest of the time. If the flywheel weighed say, 10 pounds, it would expend its momentum very quickly, since it’s having to work at such a huge disadvantage of *it’s* mass+momentum to the bike and rider’s mass+inertia. To put it another way, this device can only either be pretty much useless in actually moving its rider forward, due to its LOW weight, or it would be more of a human energy waster, due to its HIGH weight, and the increased human energy required to move along when it’s *not* “helping”. Are there any exploded views of the inside of the Nuvinci 360? I want to know what’s under the big cover behind the sprocket. Having said all that: My brain is thinking over the same basic concept but linked to an electric generator to recharge batteries on an e-bike? Ok, number one, no tensioner is necessary for the nuvinci, its an internal cv transmission with torque sensitive automatic shifting. The chain is in line with the rear sprocket all the time. It uses a chain of constant size no matter what “gear” its in. All the “shifting” is done inside. At least that’s my understanding. Two, this isn’t a motor. Its not to allow you to spool a bunch of energy into it and then coast for as long as you spent putting energy into it. Its to allow you to store a finite ammount energy to more or less be instantaneously in concert with the effort of the rider, not as a means of propulsion, sort of the way the mid range e-bikes work. It for adding a speed boost during standing starts, or to help level a hill, not for speed but for acceleration to you crusing speed, not beyond it. In order to get energy out of it, you have to be at a lower energy state than you were when you charged it. If you try to engage this while at a higher speed than you charged it at, it will actually slow you down, while being charged, nature tries to reach equilibrium. As far as using this as a recharge option for an e-bike, keep dreaming, its about as useful as pulling a solar array on a trailer behind you. Not quite that bad, but close. 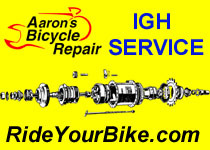 You would be better served by replacing the front hub with a hub generator at only six volts. Wire that into a charge controller and a bank of capacitors that will stack the voltage up and release it to the charge controller when you fill them and then dump it into the battery you will need a dielectric gate to prevent back charging of the capacitors from the battery. This would be a better set up for lithium batteries than lead batteries. For lead skip the capacitors and just dump a constant stream of low voltage into it to microcharge. It won’t top up the battery, but it will extend range somewhat. Hub jennies are pretty small and light when compared to a 15 lb fly wheel and dual trannies to turn the fly wheel and transmit from the fly wheel to the jenny. They generate at a lot lower rpm than a standard small generator also. This would be more useful as a full time drive fly wheel that spools up as the bike is in motion with a dead man lever to engage it with a clutch. 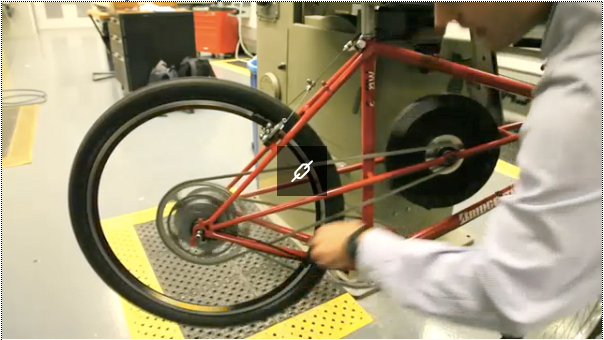 You could store more energy in the fly wheel by pedaling into it than you could by using it as a brake reclamation dump. The fly wheel needs a shroud around it and would be less cumbersom and more stabilizing if it was lower and more forward. Even better would to be to put freewheeling flywheels around the hubs (front and back) that are engaged with a clutch and a dead man lever. This would cause the bike to be over stable in turns when the wheels are spooling but engaging them in turns while braking would reduce this. It would actually increase handling by slowing the bike while adding torque to the wheels. A little tough on the brakes though. Anyway, this is neat, but limited in scope. If you expect more out of it than what it was intended to do, you will be dissappointed.